Here are some destination Caribbean wedding tips to think about while you're beginning the process of planning your wedding. Here are some destination Caribbean wedding tips to think about while you're beginning the process of planning your wedding. Go through them all and contact us with any questions you have. We'll be your providers of destination Caribbean wedding tips all the way through the planning of your most special day. We've done it so many times before, but we never forget how important your wedding is! • Yes, Caribbean destination weddings are legal everywhere in the world. • Create a list of “must invite” guests that you wouldn’t get married without and check that they’d be able to make it. Remember that beach weddings are for your direct family and best friends. You don’t need to invite everyone that you would normally invite to a traditional wedding. 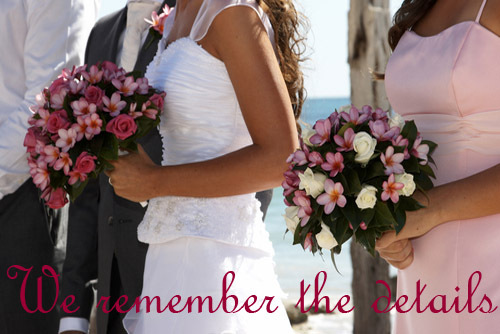 • The sooner you start your destination Caribbean wedding planning, the higher the chances that your guests can make it. • Guests usually pay their own way to Caribbean weddings. However, you are saving a lot of money by having your wedding in paradise. If there are a couple “must be there” people who can’t afford it, contributing to their travel costs is a good idea . Just talk to your All Inclusive Resorts rep and they’ll take care of it for you. • Many of the resorts offer free weddings, but you usually have to pay notary and licensing fees. Look for the asterisk beside the offers on their websites. • Usually, the basic wedding package is very “low frills”, you are probably going to want to make some upgrades, but choose them carefully. You can very quickly add thousands of dollars in costs. • The upgrades that we suggest are paying a little extra for a private reception (yes they will put you in a shared area if you don’t ask) and a photographer’s services. You want to have great pictures of the event. • Most resorts have a wedding event planner who will send you all the information you need. We’ll contact them for you once you decide on your hotel. • We will also book you some time with the events planner when you get to the hotel so you can make last minute decisions and plan out your day. • With All Inclusive Resorts, we will book all of your rooms for you. We will also look into wholesale airfare for you from all of your guest’s departure points, but you are not required to book airfare from us. • Most of the time, the bride and groom want to hang out with their guests for the whole wedding vacation. If you really want to have a private honeymoon, we’ll arrange a transfer to another hotel for a few days after the wedding. • Remember to hold a Wedding party or BBQ when you get back home. This way you don’t miss out on the second best part of getting married – the presents! Any other questions? Need more destination Caribbean wedding tips? Feel free to contact us at All Inclusive Resorts Inc – that’s what we’re here for. Return to homepage from Destination Caribbean Wedding Tips.